I love this city. 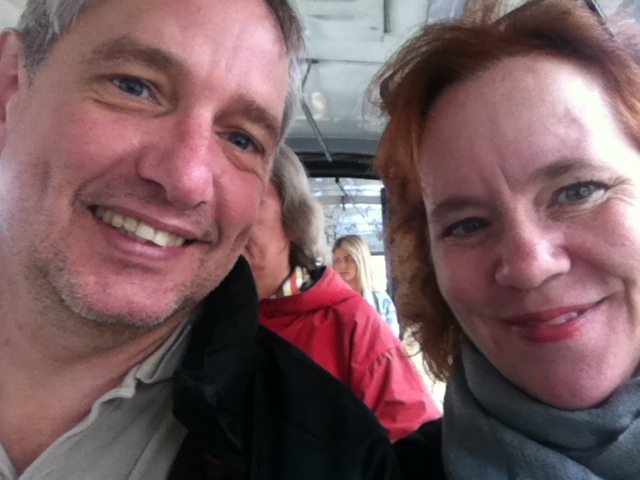 We wandered all over the Old Town, and figured out how to ride the trams (hint – don’t bother buying a ticket, just get on; that’s what everyone else does here). We drank strong lovely foamy coffee in tiny cups, and ate gelato and meat pies and today had the best pizza ever… we are just across the Adriatic from Italy, after all…. I bought a book called Goodbye Sarajevo – written by two sisters who were 12 and 18 when the war started. After walking the city for a few days, it was a perfect read, because all of a sudden the streetscapes she described to me were familiar, and the true horror and surreality of a war here a mere 15 years ago hit me in full. 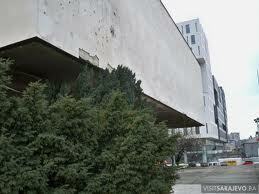 Today we went to the History Museum which had an excellent permanent exhibition about the Sarajevo Seige. I’m finding all of this fascinating and chilling and just somehow incomprehensible. The people we see on the street – teenagers – were alive during that war! I can barely understand, but we are surrounded by the reminders of it: bullet holes in buildings, facades chipped and weary, and more disabled people than I’ve seen in a while – wheelchairs are fairly common to see (note to self – if I want to take daughter on a trip, a recovering war zone is a good bet for access ramps). outside of the History Museum of BiH. Left, I think, intentionally bullet-ridden. It has rained all day. We are cheery about it, but wandering the streets in the rain eventually loses its appeal. We came “home” for a siesta and are getting ready to go to a swanky restaurant that Bono goes to every time he’s in town, apparently…. Too bad, Brad and Angelina were here last month. We’ve been eating Bosnian fast food, so this is out fancy pants outing. I think it's the milk run... hopefully the scenery and people are fun! Tomorrow, we’re off to Dubrovnik. We could have paid a taxi to take us, probably, but we chose to instead take a bus. It’s not that far, but will apparently take 7 hours. We leave early in the morning and get there at around 2 pm, so we’ll still have lots of time to get into out apartment that we’ve rented for a couple of days, and then do some exploring. Odds are we’ll want to stretch our legs after 7 hours on a bus! We are weirdly anticipatory about this. Considering it takes almost as long to take the bus from Sarajevo to Dubrovnik as it did to fly from Toronto to Sarajevo, it had better be amusing…..
We’re having a terrific time. It’s only Tuesday and I feel at least a week-rested. We’re working at not having set schedules, and learning to just wander, and to sit and sip coffee/beer/wine when the mood strikes us. More photos on Facebook, here. Love following you through these streets. A wonderful peep-hole in for us. The map is great –necessary bearings for me .. a grand adventure. I checked out the “fancy-pants” restaurant you are were going to tonight. Restaurants that have menus with no prices, scare me…………………… I hope it was great though. 7 hours on a bus, hmmm, have fun. Hopefully the scenery is fantastic! OOOOPs, P.S. : I love, love love the photo of you two! Love reading your blog ! The pictures are amazing, I would never have thought of going to any of those war torn countries, but wow ! Beautiful!! And I really appreciate the humanness that you share. Mr. 761 must be loving the absence of dust, yet the familiarity of bullet holes! LOL ! Ironically, I am in the near Artic, and have been taking long weekends in Nova Scotia,and PEI for sanity breaks. Doesnt look like fall yet, and I am still swimming in the ocean. Maybe there will still be a touch of summer left when you return.